BRADENTON, FL - The Bradenton Marauders, Class A-Advanced affiliate of the Pittsburgh Pirates, put on a show for the second year in a row for their home opener, beating the Charlotte Stone Crabs 13-0 Friday night. Major League rehabbing catcher Chris Snyder fell one RBI shy of a single game team record with six knocked in. Snyder began the scoring in the first with a towering homerun off Crabs starter Alex Colome. The shot brought home Evan Chambers who had walked and stole two bases in front of Snyder. The Marauders as a whole let loose in the second, knocking Colome from the game. Bradenton sent 11 batters to the plate and did not make an unproductive out until the third of the frame. Outs one and two were both sacrifices, the second one a sac fly from centerfielder Evan Chambers. The biggest blow of the frame came with the bases loaded and one out. First Robbie Grossman drew a seven pitch walk before Jarek Cunningham knocked his second double in as many games to drive in two more. Six more runs came across in the bottom of the fifth. David Rubinstein, Cole White and Elevys Gonzalez led off with singles to right field. Bengie Gonzalez then grounded out to score a run ahead of a two run single to right by Grossman. Following a walk to Cunningham and another single by Chambers, Snyder came back up with the bases loaded. The big leaguer slammed a ball off the top of the wall in left-center and cleared the bases for his six RBI total. He fell a triple shy of the cycle. 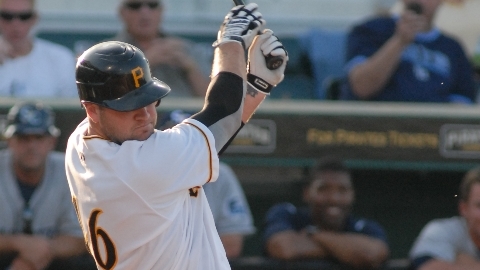 In two games with Bradenton, Snyder has gone 5-for-6 with seven RBI, two doubles and a homerun. Friday night's offensive output comes a year to the day after Bradenton began the 2010 season with an 18-3 win over Fort Myers. That 15 run margin of victory still stands as the largest in team history. Bradenton did set a record Friday by drawing 10 walks, tying the 10 it took against Palm Beach on April 27th of last year. On the mound the Marauders also shined. Joe Beimel threw a perfect inning while working his way back to the Major Leagues. It was not an official rehab appearance because Beimel signed a minor league deal with the Pirates this offseason. Matt McSwain took the win with five innings of three hit relief. Jeff Inman and Gabriel Alvarado also contributed to the shutout. Colome took the loss for Charlotte. The Marauders and Stone Crabs meet again Saturday at Charlotte Sports Park. Quinton Miller gets the start against Chris Andujar at 6:30. Radio coverage begins at 6:15 on 1280-AM WTMY. For more information call 941-747-3031 or go online to BradeonMarauders.com.